Everyone wants straight teeth – they are healthier, function better, and look so much more beautiful than crooked, crowded teeth. That’s why we offer comprehensive orthodontics for both adults and children. Sure, a great-looking smile is a wonderful result of orthodontic treatment, but there is so much more to think about when considering orthodontics for your children or for yourself. Crowded teeth, crossbites, and other misalignment issues can cause pain, difficulty with chewing and, therefore, an inability to eat well, poor dental health, and embarrassment. But that’s not all. Dental misalignment can cause speech problems, breathing problems, and even lead to difficulty swallowing. Add all that to the fact that teeth can wear abnormally, be more prone to decay, and put undue stress on your gums and supportive bone, and you have a major problem! Our adult and pediatric orthodontic treatments address all of those things and give you a beautiful smile as a bonus. We know it’s true that veneers can cover minor crookedness or gaps, but to really correct these issues and get your jaw in a proper position for comfort and function, adults can need orthodontic treatment. 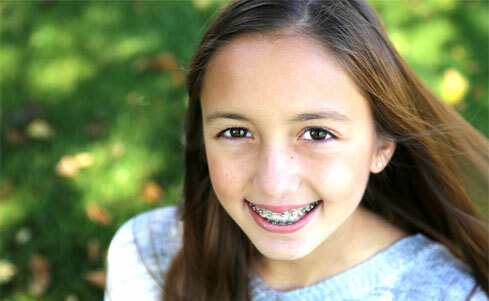 Braces can also be a useful adjunct to cosmetic treatment. By going into braces before any cosmetic treatment we can put your teeth in their most ideal position, widen your arch and, ultimately, achieve more beautiful results. Early treatment of malocclusion (a misalignment of the top and bottom jaws when you close your mouth) in children is key to their proper oral facial development. Often we can correct a severe overbite at an early age preventing years of imbalance in facial growth. In addition, many children find relief from allergies and airway problems such as mouth breathing when jaws develop properly as they are growing.